Generate Value from your SAP Transport Management System (SAP TMS) through product demonstrations, proof-of-concepts, feasibility studies and end-to-end implementations. SAP Transportation Management Systems offers a variety of processes and functions that customers can implement over time to extract value. 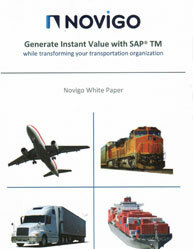 This descriptive whitepaper defines transportation value criteria and ties them to standard SAP TMs processes. It highlights: What are the deployment and transformation aspects of a SAP Transport Management System initiative? How to extract value from a new Transport Management System in SAP ? What are the criteria to select a Transportation Management System in SAP ?How to select the right SAP Transportation Management System that fits your organization's needs? How to start or accompany your own SAP Transport Management System initiative? How does SAP TMS fit into your respective IT strategy and landscape? Is SAP Process Integration (PI) Necessary for SAP Transportation Management implementation? Download this ''SAP Transport Management System PDF'' that focuses on how to drive the most value from a SAP Transport Management initiative. Transportation management systems economics can aid in the tasks of moving materials through the ability to quickly process the massive amount of data and variables and supply the information that logistics professionals need to make quick, accurate and cost effective decisions. Transportation costs are one of the biggest expenditures for companies, and these costs continue to increase. 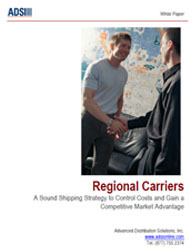 Download this descriptive whitepaper that brings you the current conditions of the industry, what factors are contributing to these increases, and the benefits to why a Transportation Management Systems is so important. It covers: How to reduce transportation cost in supply chain? How can the business intelligence information gained from a Transportation Management Systems invaluable to the user firm? What are the issues that Transportation Management System users face today? 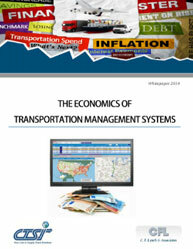 Read this whitepaper to know more about the management of transportation functions in the transportation economics. The outsourcing of freight bill audit and payment is an important financial step for an outsourcing firm and should be treated as such. While most of the firms are financially sound, well-managed businesses, the general business climate dictates the importance of thorough financial due diligence in selecting a provider. This informative white paper highlights a number of steps that can be taken to ensure a successful relationship, protecting and minimizing the financial risk to the outsourcer. Some of it includes: Investigate the reputation of the freight bill auditing and payment firm used by the provider. Make sure that statements and other documents are examined by qualified financial personnel. Investigate the reputation of the FBAP firm’s senior management. Ensure that the Freight Bill Auditing and Payment firm’s financial controls are tested at least annually by an independent auditor. Download this whitepaper to know more about: Why and how to outsource freight bill audit and payment services? 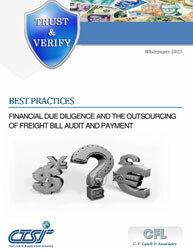 What are the significant advantages to outsourcing freight bill audit and payment? Why freight bill audit and payment firm should not be too reliant on one or two clients? What are the major reasons for outsourcing failures in freight bill audit and payment? Transportation Optimization is a strategy being adopted in greater measure by companies of all sizes. Grappling with volatility in demand as well as increasing transportation-related costs, businesses are looking to supply chain management solutions such as emerging transportation optimization software to help drive and maintain competitive advantage. Do you want to know what are the opportunities you are missing in transportation management? This whitepaper can answer your queries and can give you a brief idea on the following areas: • How marketing executives can be rescued from being handicapped due to lack of effective analytical tools. • It can boost your knowledge regarding in class optimization software which moves towards the integration and configuration process in transportation optimization. • Powerful business planning tools. Building Sales & Operations Planning (S&O) around a “Plan, Do, Check and Act” (PDCA) process represents a proven way to align financial goals with operational reality. Unless you develop a sound Sales and Operations Planning (S&OP) process based on a PDCA methodology, your struggle to meet projections will continue to persist. What are you doing to improve your sales and operations planning process? This whitepaper outlines how to build and improve S&OP around PDCA by working a plan in iterative steps. It addresses questions like: Why do you need Sales and Operations Planning processes? How to drive performance improvement with S&OP processes? How to ensure your sales and operations planning process is robust? Read this insightful whitepaper and make your best financial projection moving forward, and resolve to drive Sales &Operations Planning process. When you devise a plan, work it, track it and refine it, you become more organizationally stable, more competitive, less fearful and in control !! Acumatica is a web-based financial and business management system that can improve the productivity of your organization. The software Acumatica runs on servers in your private network or hosted on the Internet so it can be used from anywhere. Acumatica is designed to be used by any size company- from small companies with specialized requirements through large companies with multiple entities. Read this technical whitepaper, “Why Choose Acumatica“, to learn more about: How Acumatica integrates ERP and CRM into one solution Top reasons why Acumatica is cost effective Top ways Acumatica can improve your business Robust set of core financial platform benefits and CRM features of Acumatica This whitepaper on Acumatica brings you a cost-effective way to improve your business using web-based financial and business management software.